Any exposure to asbestos fibers is a health hazard to anyone. 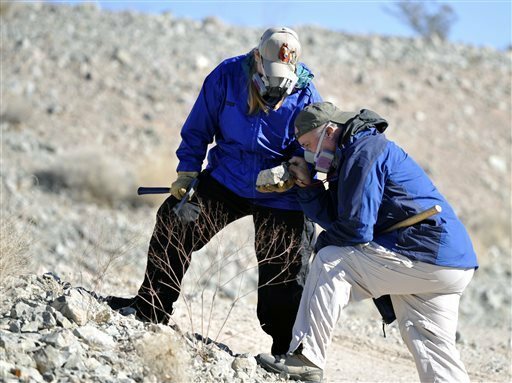 Recently, geologists discovered asbestos fibers in Nevada. The discovery was made in minerals and rocks at Boulder City and Las Vegas Valley. The asbestos fibers are not everywhere but they can be found easily. One geologist recalls, walking her horse for a couple of hours and finding asbestos fibers in her shoes and pants. Out of the six types of asbestos regulated by the EPA as toxic, actinolite was found in many areas. Geologists who are not taking samples of the area, are taking precaution.Geologist usually take their students to take samples of what is being discovered but the geologist quotes, "She doesn't want to expose them to something with the potential of shorten their lives. They're too young." Although, it is naturally accuring, asbestos is classified as a human carcinogen. If asbestos is inhaled or swallowed, individuals can increase risks of lung disease and respiratory complications.Whether you live in this area or visit the surrounding area, take precaution. You may research more about this topic at the Las Vegas Review Journal. If you think your home or building contains asbestos, it is important to seek professional assistance. Alliance Environmental is a licensed asbestos removal company with extensive experience in properly containing the asbestos, complete decontamination of the site, and lawful disposal of the contaminated materials.